Cinco de Mayo commemorates the Mexican army’s victory over the French at the Battle of Puebla, and when it comes to celebrating the holiday in the city of angels, it’s a true citywide affair. Since L.A. is overflowing with food deals, drink deals, and tons of special events to celebrate the occasion, we figured it would be good to catalogue a quick list of ideas for how to get in on the action. 1. Be entertained by Lucha VaVOOM a high adrenalin Mexican masked wrestling extravaganza (May 5-6) expect tamales, Aztec dancers and plenty of tequila. 2. Get festive with DJs, a female mariachi band and a piñata workshop during ¡Fiesta at FIG! a Cinco de Mayo Celebration at FIGat7h in Downtown Los Angeles. 3. 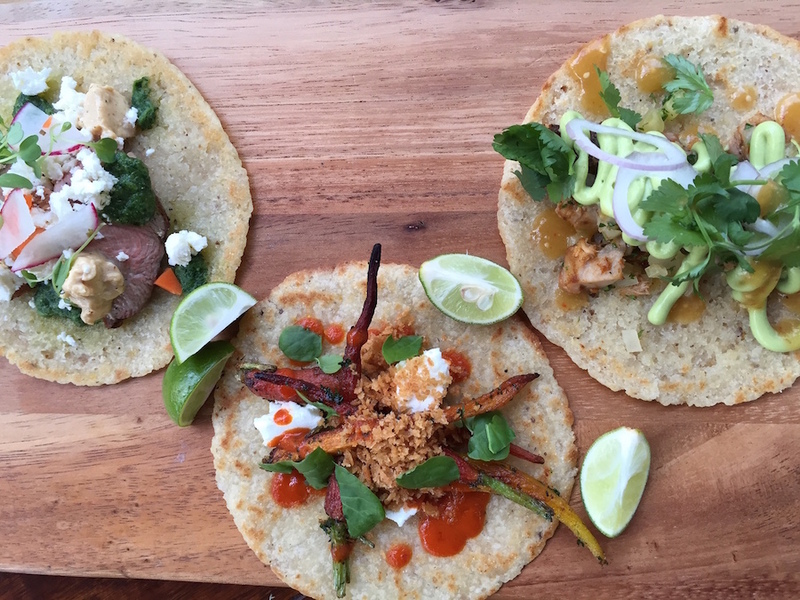 Sausal will be serving margarita snow cones AND Mexican hot dogs wrapped in bacon. Tequila enthusiasts can order the Calle 23 tequila flight for $15. 4. El Chavo is hosting a night of live music, street tacos and corn, lots of Cervezas, Mezcal, Tequila, frozen Palomas and Margaritas. 5. WP24 by Wolfgang Puck is celebrating the holiday with $3 tacos, horchata ice cream coupe, house-made chorizo, churros and more all atop The Ritz-Carlton in DTLA. 6. Throwback Thursday “Tacos & Tequila” at Casa Vega, order “The Boss” margarita to get access to a 60¢ taco, there’s also a party with drink specials and a photo booth. 7. Take a bite out of Mexico through a waffle! with the Carnitas “Torta” Bruxie with slow roasted pork, black beans, guacamole, shredded romaine, chipotle mayo, cotija and salsa fresca. 8. Celebrate Cinco de Mayo now till the 5th at The Morrison in Atwater Village, where food and drink specials will be served all day. 9. Big Bar creates the 4th edition of the Largest Margarita in all of Los Feliz and launches the Big Bar Sangrita. Festivities start at noon. 10. “Blended” margaritas, a Mariachi band and FREE cotton candy over at Gracias Madre. Band starts at 5 p.m. specials start early at 11 a.m.
11. Sip on a Oaxacan Flower at Rascal, composed of Alipus mescal, Bols triple sec, Bertina elderflower, fresh grapefruit juice and an orange twist. 12. Chill out at SOL Cocina Playa Vista with a Mango Con Chile Frozen Margarita, boasting icy mango purée served in a chile-salted bucket glass with a dried chile-mango garnish. 13. Celebrate Cinco De Mayo New Orleans style at the Little Easy. Toss back a 1664 Michelada ($6.00) and take advantage of half off tequila shots! 15. Indulge at The Raymond 1886 with a Blood in Heaven with Mezcal El Silencio Espadin, lime juice, pineapple juice, honey syrup, passionfruit syrup and a Peychaud’s bitters. 16. Drink the award-winning 120 Margarita this Cinco de Mayo, it will only be availble for one day over at Hey 19. 17. Free screening of Texas Before the Alamo at LA Plaza de Cultures y Artes. [UPDATE] Revolutionario Tacos plans to hand out free vegetarian tacos (one per person) to the first 500 customers on Cinco de Mayo. [UPDATE] Free margaritas for all Roo app users (one per person) at Shore Bar in Santa Monica. What do you recommend doing for Cinco de Mayo in L.A.? Let us know in the comments below!